Homemade gift baskets can either be highly personalized or basic enough in theme to give to someone you don't know, meaning... there is always a gift basket idea for any one and any occasion. 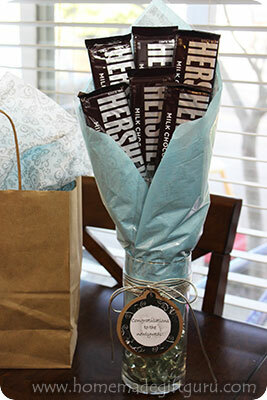 Below you'll find a variety of homemade gift basket suggestions... Ideas will vary depending on the person and occasion. Hardly ever do two different gift baskets for two different people turn out the same but these ideas will give you a great place to start! Cooking and Baking Themed Gift Basket Suggestions: These gift basket suggestions make great homemade gift baskets for college students (with a kitchen), homemade house-warming gifts and gifts for teens learning to cook and/or bake or even adults who are getting into a new type of cooking. 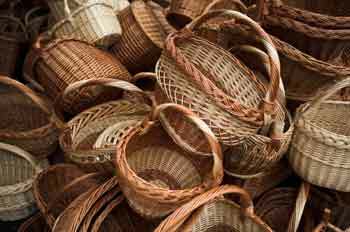 These baskets can also be used to pamper a Home Chef! For example, some people have a hard time spoiling themselves with really nice bake ware…, so if you know someone like that, get them a high quality piece of bake ware and then surround it with inexpensive but sweet and relevant baking supplies. 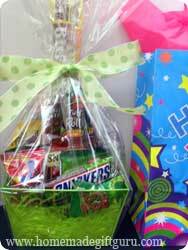 Activity and Outing Gift Basket Suggestions: These gift basket suggestions are full of fun! They are designed to be a perfect compliment to special plans. 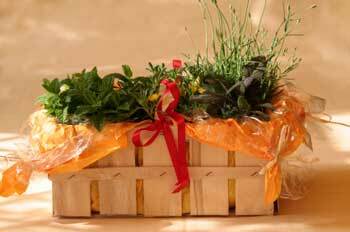 Gift Basket Suggestions for Gardeners: For gardeners or garden dabblers these themes are perfect. You may want to focus on a special type of gardening such as roses. Give them everything they need for beautiful flowers plus a little something extra! 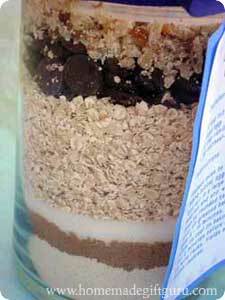 Tip: For a wonderful and cheap homemade gift idea, try adding some starts from your own garden. You can plant them in very inexpensive terra cotta pots and place them around other items. 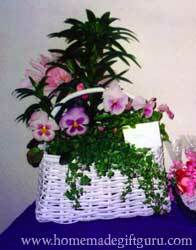 You can also use the basket to create an fresh arrangement of flowers like a bouquet, using fresh flower florist foam (the kind that soaks in water) and again lining the basket with plastic to keep in moisture. Beautiful dried and silk flower arrangements can be made by using dry florist foam in a basket, pick out a few flowers that stand out (sets of 3 work well) and plenty of filler flowers. Fresh Flower Basket Arrangements: sunflowers, summer flowers, fall flowers, centerpiece arrangement in coordinating colors, kids can even pick a variety of weeds and wild flowers for a small basket for grand parents etc. Planted Baskets: herbs, bulbs, flower combinations. Now that you've got some gift basket suggestions and ideas, here's some handy tips and instruction for making gift baskets. Instructions Tips and Tricks for Making Gift Baskets Like a Pro!